Next Tuesday the 29th marks the official date of November’s new moon. It feels like just yesterday that I was staring at the sky in awe at our November Super moon! Sometimes our lives our so packed to the brim we often lose track of time, which is why I find it so essential to set aside a moment or two to reconnect through ritual. Rituals, however small or elaborate, incorporate action and intention in order to harness creative power within us. We plant the seeds of our desires and dreams at each new moon because it marks the beginning of a new 29 day cycle. It is the perfect occasion to reflect on what it is you truly want and what is standing in your way of getting to it. Often we carry around old beliefs that are no longer serving us and the new moon is a fitting time to cast away those limiting views. An important start to any ritual is purifying and grounding. My favorite way to begin is by smudging my space and myself with sage. This act is rooted in Native American cultures and traditions and is a ritualistic way to cleanse a person, place or an object of negative energies or influences. This specific new moon is at seven degrees Sagittarius, which is a fire sign. In order to incorporate the fire element of this new moon, I encourage you to light a candle; the light from the candle serves as a symbol of our light within that illuminates our own truth. Sagittarius is said to be thought provoking in nature and unlike Scorpio, it isn’t overwhelmed with intense feelings. I, like many, was heavily caught in the fear and shock of the most recent political events and it was difficult to comprehend what was happening. Luckily our new moon is influenced by the insouciant Sagittarius, who avoids becoming wrapped up in emotions and instead uses creative fire to to gain a broader perspective. I think we can all use this energy right now! After smudging myself and lighting a candle, I normally settle in by meditating. I created a meditation specific for the energy of the new moon that I love sharing with you here. Otherwise, you can just take a few moments to breathe deeply, slow your thoughts and center yourself. 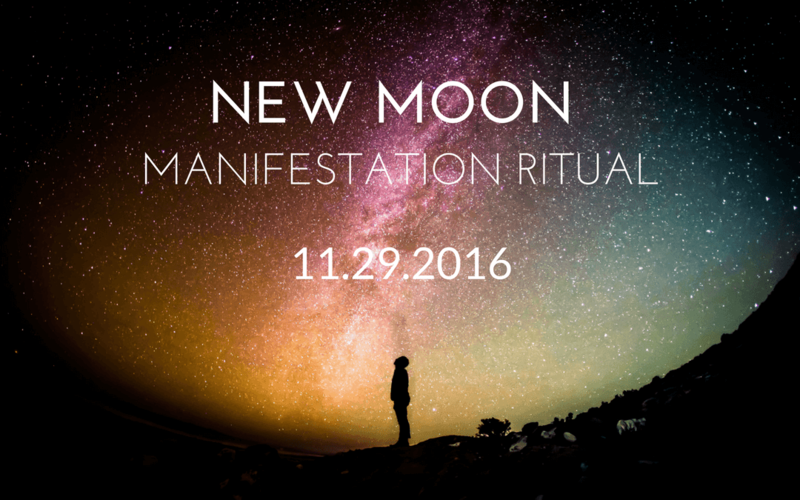 If you’ve performed a new moon ritual before, you may have a list of intentions you compiled from moons past. Take a moment to review what you included to take inventory. If there are items on your list that have yet to appear, don’t worry! As I mentioned before, it often takes longer than one cycle to manifest intentions. Perhaps you’re no longer even attached to some of the items on your list or you’ve come up with more; That’s great! However no matter what has changed, we try to never scratch out items on an old list. It’s far better to start a brand new list that feels most authentic for each new cycle. It’s always important to note that the universe works in mysterious ways and often sends us blessings in different forms than we originally imagined. Be flexible and open to all the variations of progress and transformation. After I compile a list, I like to close my ritual by inviting in the energy of gratitude. I imagine what it would feel like to actually live all of these dreams and let that feeling permeate every part of my being. I’ve learned that a huge part of manifesting involves allowing yourself to feel as if you’ve already accomplished what it is you desire; that very energy is what will attract what you seek! Once you’re full to the brim with gratitude and contentment, take a moment to find a special home for this piece of paper until the next new moon. Many women like to place it beneath a healing crystals but my personal favorite spot is underneath my favorite succulent! Every time I water it, I imagine my intentions blooming. All in all, try your best to keep it simple. Don’t get bogged down with the details or any specific instructions. Just listen to yourself and do whatever it is your heart is asking for. That may just be a nice long bath or quiet time writing in your journal…The significant part is carving out the time to nurture yourself and ultimately feed your soul.